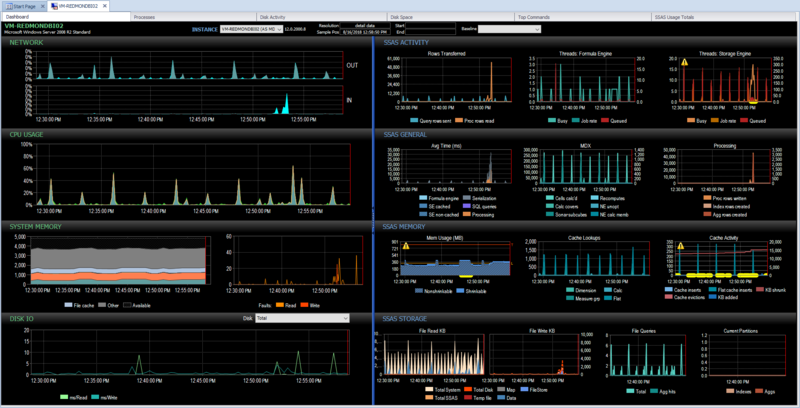 The Top Commands tab shows Analysis Services query level collection and any MDX, DAX, or XMLA commands that have run longer than one second. All of the like queries have been rolled up and grouped together so you can see their total impact. 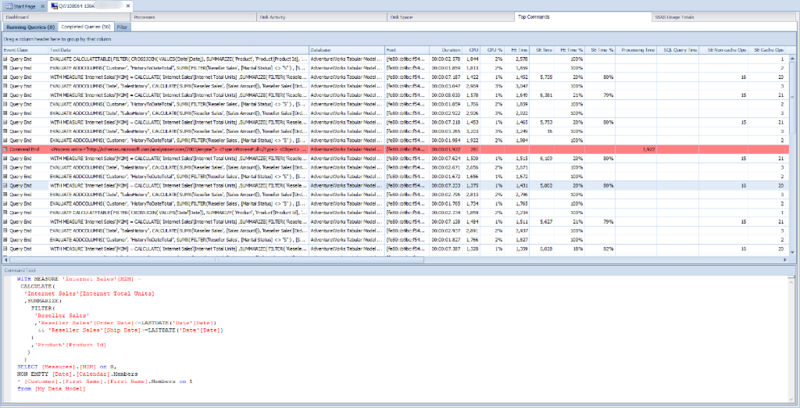 Drill down to see individual queries and group by event class to do discovery on the grid data. 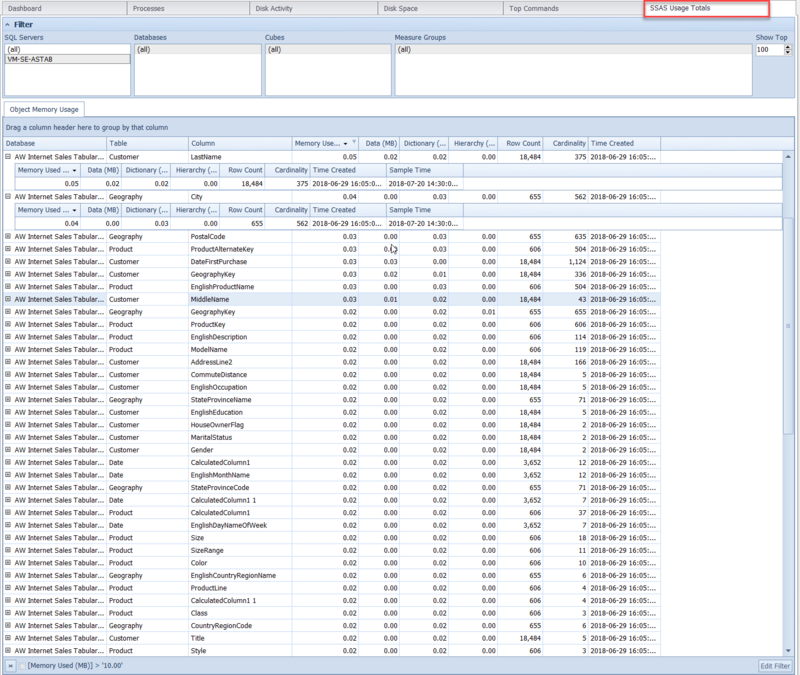 Parameters Contains the parameters for parameterized queries and commands associated with the query event. CPU % The percentage of CPU time used by this event, in relation to any other Top Commands events that are shown in the grid. FE Time Time spent by workload on the Formula Engine. SE Time Time spent by workload on the Storage Engine. Processing Time Time spent by workload processing. 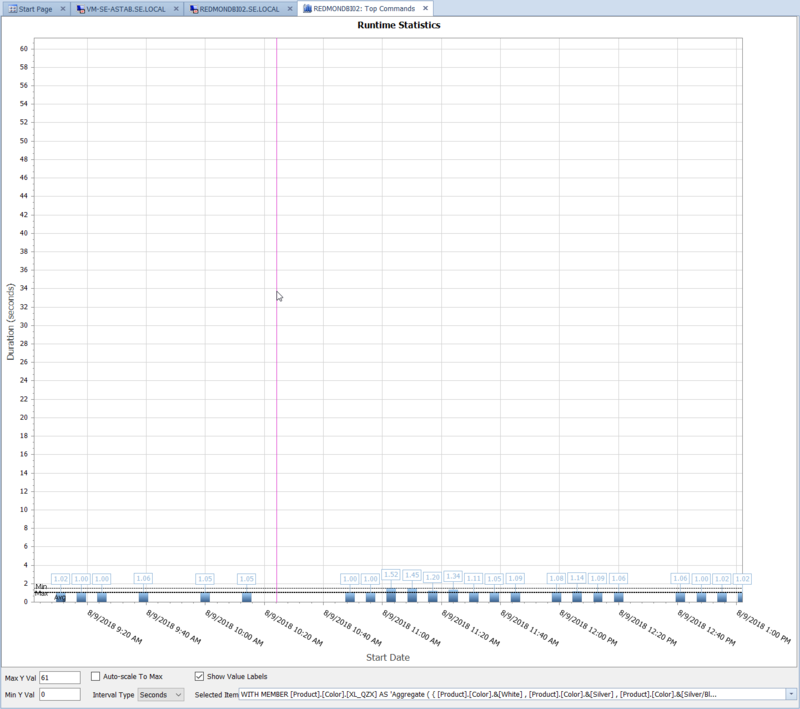 SQL Query Time Time spent by workload in SQL queries. SE Non-cache Ops Number of Non-cache Storage Engine operations. SE Cache Ops Number of Cache Storage Engine operations. Callbacks Applies to Tabular mode only. 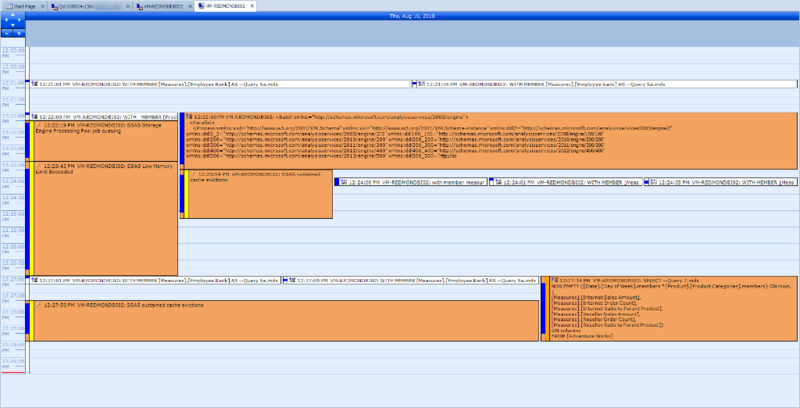 Provides the number of callbacks from the VertiPaq Storage Engine to the Formula Engine associated with the query. Measure Groups Provides a count of the number of Measure Groups accessed by the query or command. Partitions Provides a count of the number of Partitions accessed by the query or command. Agg Hits Applies to Multidimensional mode only. Provides a count of the number of Aggregations accessed by the query. Dimensions Provides the dimensions of the query hierarchy. 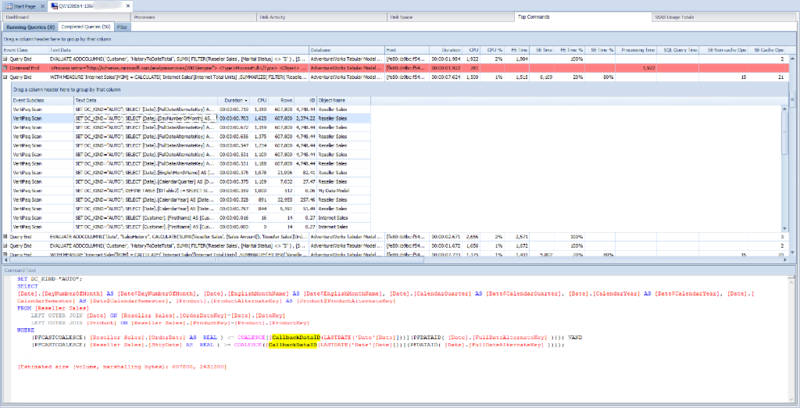 Attributes Provides a count of the number of Attributes accessed by the query. Rows Sent Provides a count of the number of rows returned by the query. Processing Rows Provides a count of the number of rows processed by the command. Errors Error number of a given event. Error Text Contains the text data associated with the error event. Reads % The percentage of bytes read by this event, in relation to any other events that are shown in the Top Commands tab. Writes % The percentage of bytes written by this event, in relation to any other events that are shown in the Top Commands tab. Right-click on any query, and Jump To the dashboard. You can also Jump To > Calendar to see what else is running at the same time, or Jump To > Runtime Stats to see if there are any outliers on runtime. For more information about Disk Activity and Disk Space, see the Disk Activity and Disk Space topics. Jump To > Jumps to the corresponding tab. Add/Edit Notes Adds or edits a note to the query. Hide Hides the query from the list. Copy > Copies the cell, row, or entire query to the clipboard.